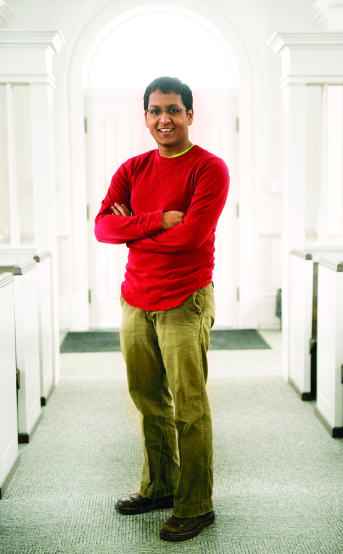 UI student Renugan Raidoo beat international competition to become a prestigious Rhodes Scholar. This past fall, UI senior Renugan Raidoo learned he would be one of 32 Rhodes Scholars in 2011, chosen from among the best college students worldwide. The first UI student to win the highly competitive scholarship since 1993, he'll study at Oxford University in the United Kingdom next year, courtesy of the Rhodes Scholarship. Was he surprised to be chosen? "I never thought in a million years I would win this scholarship," he says. While Raidoo was wrong about that, he got everything else right. In fact, he didn't even expect to be a finalist, so when he was invited for an interview, he stayed remarkably calm during the grueling process. His interview questions were all over the place. What is the best French film of the 20th century, and why? Is there an objective set of ethics, or are all moral systems socially constructed? Do you believe in American exceptionalism? The judges finished by asking Raidoo to sing for them. Luckily, the talented singer was able to perform a song by Schubert-in German. Why did he have reservations about applying? As a person of color and a native South African, Raidoo had deep misgivings about the Rhodes Scholarship. "Cecil Rhodes was a famous imperialist after whom Rhodesia was named, and who made most of his wealth from diamonds in South Africa," he explains. "I think he took a lot from Southern Africa, and so for me that was a difficult choice to make." His decision to apply was based on recent changes by the Rhodes Foundation, including scholarships for South African high school students who otherwise wouldn't be able to attend college. Raidoo's family has deep roots in South Africa. Raidoo's ancestors were brought to the country 150 years ago as indentured servants to work in the sugarcane fields. Two of his great-uncles were active in the African National Congress with Nelson Mandela, and they were imprisoned with him on Robben Island. As Raidoo says, "South Africa is still a place where I locate a lot of my identity and part of my cultural heritage." Raidoo's parents are both physicians, and they moved the family to Vermillion, South Dakota, in 2001-only 11 days before 9/11. It was a dramatic beginning, but 11-year-old Raidoo soon adapted. At the University of Iowa, where he is a presidential scholar, he took a double major in chemistry and anthropology, with a minor in French. He is considering medical school someday, but at Oxford he will pursue a Ph.D. in social anthropology. The Rhodes provides for three years of all-expense-paid study. Raidoo's parents are proud, but also perhaps a bit worried that he'll be so far from home. "They're really excited that I won and I get to go to Oxford, but my mother cried," he says. "I think they'll be visiting a lot."